PercussionTutor is an educational app for dedicated world percussion enthusiasts. 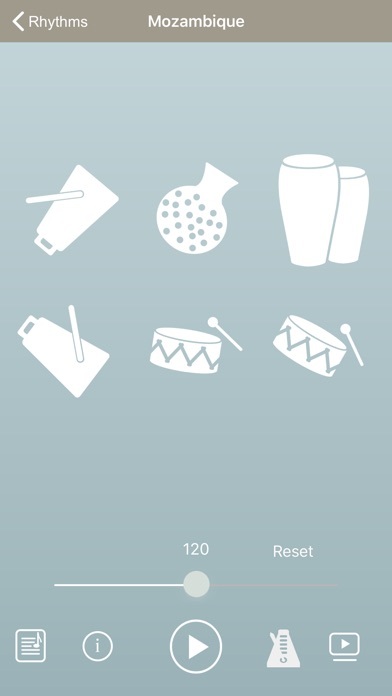 The app and its free companion book feature a unique library of world rhythms and instruments played by leading percussionists and drummers. A time stretching feature and a metronome give the users the option to practice at their own pace. NO IN-APP PURCHASES! Make sure to buy the app now and get all the future content for free. We will release updates on a regular basis adding new rhythms and videos. Lincoln Goines (electric and acoustic bassist) writes: â€œThis app is an engaging and informative way to check out the original funk. A great tool for musicians, dancers, and all lovers of rhythmâ€. PercussionTutor will allow you to approach South American, Caribbean and West African music in a different way. This app offers you more than a simple play-along. It includes standard notation, videos and specific claves. We also took the outmost care to capture the natural feeling of all those drumming traditions. For the batÃ¡ rhythms we even developed a random playback engine that will simulate an actual batÃ¡ performance. This app puts you in a live playing situation - just like you learned your mother language. You will sound more natural and more alive and you will awaken to new rhythmic possibilities. It's also a great tool for other musicians, dancers and performers who want to immerse themselves into centuries-old traditional languages. MORE RHYTMS COMING: we are working on a lot more content to be released on a regular basis! Marcos Napa, performed with PerÃº N.